So did everyone survive the launch of all launches this week? Apple released iOS 5 today, though the fallout on the Internet has been pretty severe with horror stories of download failures, overloaded connections, error codes, bricked phones and much frustration. I am in fact the only GeekBeat.TV blogger who has attempted the update and succeeded with any sort of ease; Daynah endured a 7 hour battle with the process before finally being able to declare victory. Beyond our own site, many others are reporting similar problems, including iJustine. Of course this is not unusual for new iOS releases; it happens pretty much every year. So if you haven’t updated yet, maybe sit this out for a day or two, wait for the dust to settle, and check out our report. We wish you luck if you decide to persevere; hopefully things will get easier before long! The first thing you won’t notice is the new notification system. Gone are the days of giant popups thrusting themselves into your awareness without regard for what you’re up to. Check out the image above; now you swipe down from the top of the screen and your notifications are nicely stacked there, waiting for your convenience and sorted by app. I can’t begin to tell you how nice a change this is, and stands as my personal favorite feature in iOS 5 at least for the moment. Of course I’ve barely had a few hours to play with it so this could change over time. Another big feature that’s gotten a lot of attention is the Twitter integration. 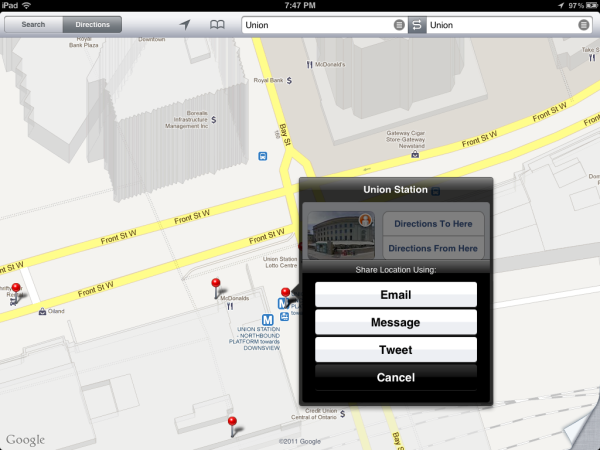 iOS 5 builds Twitter right into their API, allowing not only included apps like Maps to take advantage of it, but any 3rd party apps that developers care to work it into. Blackberry chose a really bad week to start failing on an almost global basis. 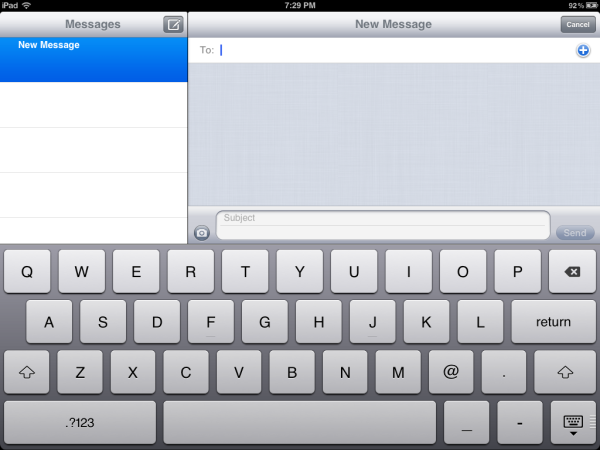 iOS 5 introduces a new Messages app that competes directly with Blackberry Messenger (BBM), simply called Messenger. Like BBM, Messenger lets you send quick text messages to any iOS 5 user for free, instead of using the more typical SMS service. 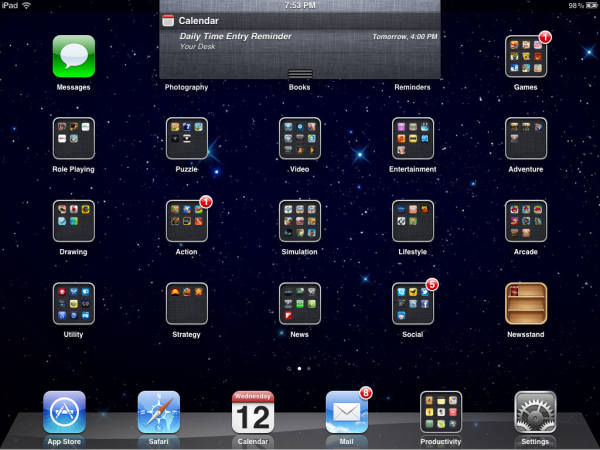 Another new app bundled with iOS 5 is the Reminders app, which augments your Calendar app to show you tasks you’re assigned and ones you’ve completed. Mine populates nicely with data taken from my Outlook tasks at work, much as the Mail and Calendar apps do. 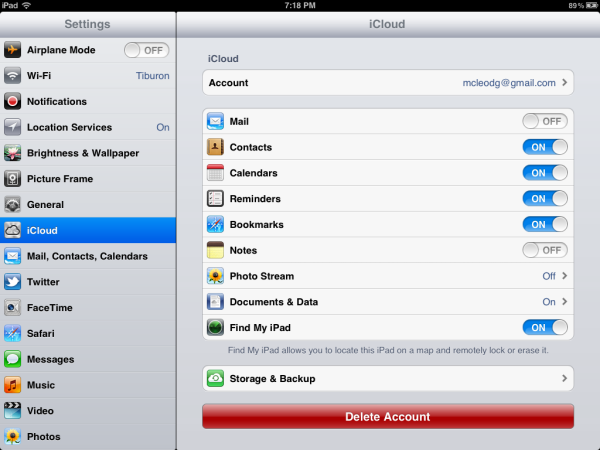 It also, of course, draws on iCloud as a resource. I haven’t had time to verify this, but it does seem likely that it’ll interact with Notifications when tasks come close to due. 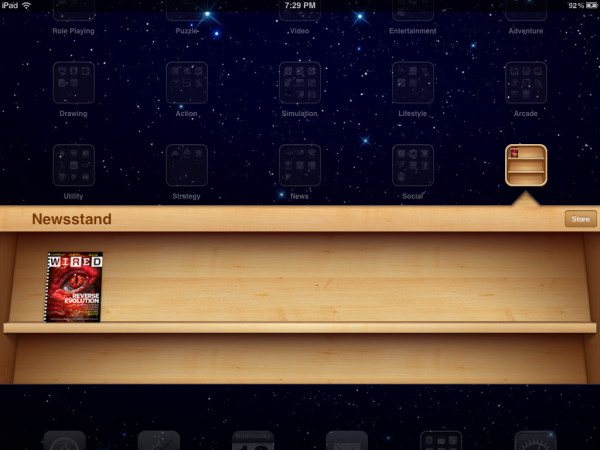 For magazine enthusiasts comes the iOS Newsstand, where your periodicals will live and be read with ease. It features a handy link to Apple’s store where you can find the titles that interest you. Of course today also marks the launch of Apple’s iCloud service. I can’t say as much about it as I’d like, as I can’t make use of all of it, being in Canada. It does bring with it the promise of moving a lot of your data, maybe all of your data into the cloud, depending on where you are and how much you’re willing to pay for the service. Along with cloud storage of music, movies, TV shows and other stuff you buy on the iTunes store, there’s also the handy Find My iPad (or iPhone, etc) feature that’s gotten so much positive attention for helping people recover lost or stolen devices. You’ll notice I wasted no time in turning that sucker on. 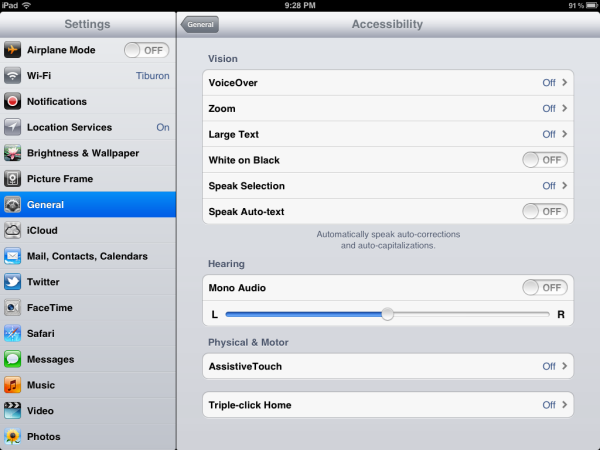 Accessibility gets a boost in iOS 5 with voice over, zoom, large text, white on black and other options designed to make the system much more friendly to people with vision or hearing problems, or even physical/motor control problems. 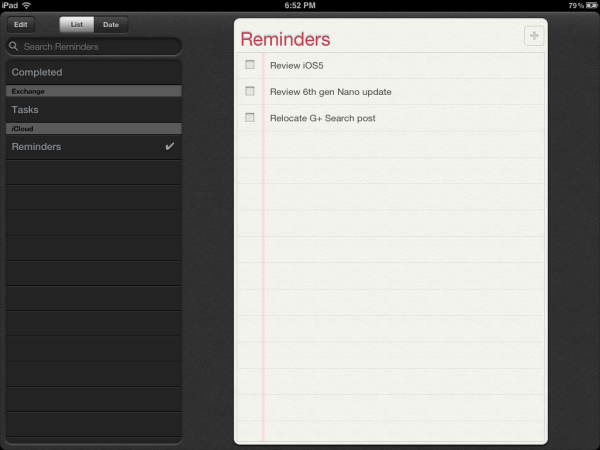 I wish I could cover Siri, but I’m running iOS 5 on an iPad 2. That should be able to run Siri, but apparently they’re limiting that to the 4S. At least for now. I’ll hold out hope that Siri will appear in a later update… who knows? In the meantime, Cali will be getting a brand new shiny iPhone 4S in the near future, and you can be sure she’ll be letting us know what Siri’s all about. So how are you dealing with the iOS 5 release? Check out the comments and let us know whether you’re updating now or holding off.